If the word from some government and military officials is anything to go by, the street vendors that have become a part of Harare’s business district are on their way out. They were given a week’s notice at the beginning of this week, and the objective here is to rid the city of pavement entrepreneurs. I wouldn’t know the political angles behind all of that. What I do know though, Is that it’s never been easier to buy anything from the street. The convenience that started off with vegetables, airtime and phone covers has even extended to mobile phones. A thriving market for second-hand mobile devices now exists in Harare, with the pavements acting as virtual markets for anyone out to get any sort of device. Recently, I was in the market for a very cheap smartphone that could offer the cheapest entry into Facebook and WhatsApp access(through reasonably-priced bundles of course) A survey of Harare’s stores shows that you need at least $40 for anything decent. On the streets, however, I happened upon prices as low as $20 devices like the Blackberry Curve. That’s not to say that phones sold at this price and on the street don’t pose a risk. When you buy something here, you have to appreciate that a lot could be wrong with it and worse still, it could be stolen. 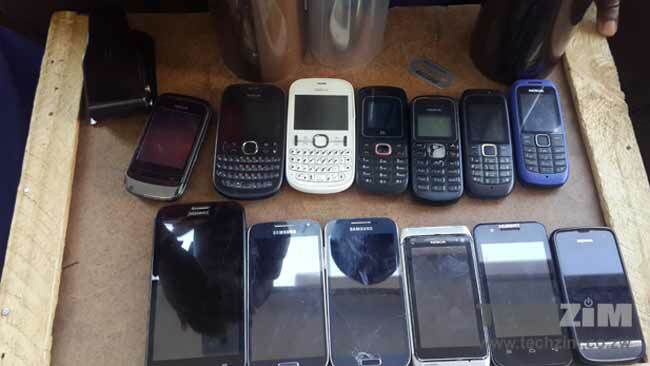 But, according to the streetside phone vendors, some have them have earned reputations as reliable distributors by selling devices in good condition that won’t have the customer coming back for a refund. This huge vendor market for second-hand devices seems to be carving out a space in the same niche that local e-commerce distributors have been trying to stake claim to. However, in exchange for all the risk that he/she lets you carry, the street-vendor offers the added value of convenience (no delivery hassles) and the ability to negotiate on a fair price. In a week all these crowded markets might be gone, but the way Ximex Mall (the former hub for second hand street devices) still has traders milling around it even after its closure seems to suggest that these guys will still find a way to sell that Blackberry at $20 somewhere else. The Devices are not second hand. They are STOLLEN. Even the smaller Vendors that sell new devices are sources them from thieves. My friend bought a new S5 last year that was flagged as stolen as soon as he went to SA and tried to buy a local sim there.